This is the first time such a review has been published since the Irish Presidency was established in 1938. 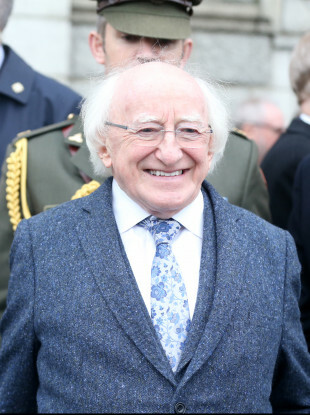 ÁRAS AN ÚACHTARAIN has published a breakdown of Michael D Higgins first terms as president. This is the first time such a review has been published since the Irish Presidency was established in 1938 and follows a commitment to greater transparency made by President Higgins. The breakdown sets out the monies spent in the controversial allowance of €310,000 which came under scrutiny in the last election. It sets out that €1.7 million has been spent on food, beverages and entertaining at Áras an Úachtaráin. It also sets out that this money went towards hosting 1,584 events such as State dinners and garden parties held during the last seven years. Between 2011-2018, six State visits were hosted, as well as 44 appointment ceremonies. A total of 52 ‘themed’ garden parties were held, 114 receptions and 209 official lunches and dinners. The 51-page document also outlines that President Higgins has spent more than €40,000 on books, research and stationary. Áras an Uachtaráin confirmed that a €238,443 underspend from the 1938 Allowance will be returned to the Exchequer by the end of the year. This is a cumulative underspend from the 2011-2018 period of the Presidency. The report notes that the Office is supported by a number of State departments which provides funding. The Central Fund of €894,000 accounts for the president’s salary, the pension of past presidents and 1938 Allowance. It also sets out that the direct cost of the Office was €3.6 million. Of this, €1.67 million went towards staff salaries for 27 people, while another €1.07 million was used to pay for the Centenarian Bounty, which is paid to Irish citizens on their 100th birthday. The report sets out that in 2018, 359 people received the payment when reaching 100. A statement released today said that “as part of the president’s commitment to greater financial transparency, Áras an Uachtaráin confirmed that the process of establishing an independent committee to provide oversight of the 1938 Allowance is well advanced. The oversight committee will be in place from early next year and will meet regularly”. Áras an Uachtaráin also confirmed that the Presidential Review will be published each year during President Higgins’ second term. Email “How much is being spent by Áras an Uachtaráin? Michael D's spending has been revealed”. Feedback on “How much is being spent by Áras an Uachtaráin? Michael D's spending has been revealed”.